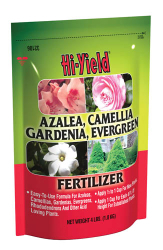 Specially formulated plant food to help produce healthy roots, stems, leaves and flowers on acid-loving plants. Can be used with new and established plants. Established plants: 1 cup for each 4 ft. of height. Spread evenly on ground around drip line.